Playlist for April 1 and April 5, 2015 “Dead Brain Cells” | The Revolution Music Radio Show! Alright, once again, man, you’re back on CILU Radio 102.7FM. I recently found out about a band from Alberta that I thought has a lot of promise and I really wanted my listeners to hear so coming up here tonite, we’re going to check out some songs by this relatively unknown Canadian band. The first track is called Photograph and then we’re going to hear Someday and How U Remind Me and Rock Star and I’m just joking, man, april fools hahahaha! Alright, that’s right, man, you’re back right here on Revolution Radio with your host of destruction, Dr. Destrukto every single Tuesday night at midnight following the Tuesday Night Creepshow and Saturday night at 1am following the Crypt right here on the coolest radio station in town, CILU Radio 102.7FM and luradio.ca on the Internet. We’re playing all the crazy heavy f’n metal and punk rock that the other stations only dream about playing, man. Tonite we’re going to take a listen to a bunch of songs by the legendary Canadian thrash metal band from Montreal, Dead Brain Cells. Dead Brain Cells started out in 1985 and put out two awesome essential Canadian albums in the 80’s, their self titled debut from ’87 and the epic Universe album that came out in ’89. Tonite, we’re going to take a listen to the entire Dead Brain Cells Universe album. This album is a concept piece that tells the story of the creation of the universe, through the rise of man to a future scenario. And later on, we’re going to listen to a few tracks from the self-titled Dead Brain Cells album. So make sure and stick around, it’s going to be a super crazy show tonite, as usual, man. Don’t forget to send us emails, comments, new cars, old cars, fancy jewelry, funny memes, great music and really good ideas to revolution1027@gmail.com and check out our facebook page at facebook.com/revolution1027 for a playlist of all our shows and upcoming show announcements. Also go to luradio.ca to get information on all the other cool shows that CILU Radio plays and keep your dial tuned to 102.7FM in the Thunder Bay for all the awesome programming that the other stations can’t play. That’s right, man, you’re back on the only station worth listening to in Thunder bay, CILU 102.7FM, playing all the extreme punk and metal every single Tuesday night at midnight and Saturday night at 1am with the Revolution Music Radio Show hosted by myself, the doctor of destruction, dr. destructo. Don’t forget to send us a bunch of stuff to revolution1027@gmail.com and check out our facebook page at facebook.com/revolution1027 for playlists of all of our shows. You can also check out CILU’s website at luradio.ca for information on all of the station’s other shows which includes a wide variety of programming that touches on pretty much every style of music ever invented. If you’re a fan of great music, you definitely want to keep listening to CILU Radio. If you’re a fan of metal and punk, you’ll probably also dig Lipstick and Leather every Friday at 6pm and Witchfinder radio every Friday night at midnight. Tonite, we’re right in the middle of listening to the entire concept album by Dead Brain Cells called Universe that came out in 1989 on Combat Records. The album tells a sci-fi story about the origins of the universe, the rise of man, and man’s confrontation with the future. 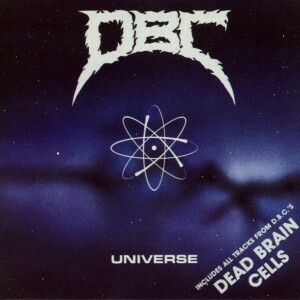 It’s a bunch of progressive Canadian thrash metal that the band termed as “brain metal.” Make sure and check out dbcuniverse.com for a bunch of information on the band and stick around tonite for a bunch of really awesome music that the other stations are too lame to play. Once again, you’re back right here on CILU 102.7FM and luradio.ca for streaming on the Internet. You’re on the Revolution Music Rdaio Show every single Tuesday night at midnight and Saturday night at 1am and we’re playing all sorts of heavy music that the other station aren’t allowed to play but you want to hear. We’re not the new rock you need, we’re the kickass rock that you crave. Don’t forget to check out the other shows on CILU Radio for a wide variety of alternative programming. Tonite we’re listening to a bunch of tunes by Dead Brain Cells from montreal, the killer Canadian thrash band that left its mark with two classic essential albums in the 80s. We’re playing the entire Universe album right now and later on, I’m going to playing a few tracks from their self-titled debut. If you like this stuff, make sure and come back next week for another episode of as the Revolution Radio turns with your dj of destruction, dr. destrukto and make sure and like our facebook page at facebook.com/revolution1027. You now those other stations just play a bunch of watered down, bland, commercial crap and you want to hear fresh, cutting edge music that’s far beyond trends and commercial bs. That’s why you’re listening to this station. And thats why CILU 102.7FM is the coolest radio station in town and that’s why you need to keep on supporting this station. Go to luradio.ca right now and click on the f.a.q. to find out how you can help the station and make sure and like our facebook page at facebook.com/luradio102.7. CILU is the only station that showcases local, independent, grassroots, multicultural, campus and community, spoken word and awesome music programs like the Revolution Music Radio Show every Tuesday at midnight and Saturday at 1am.CILU 102.7FM is the only station in town that plays folk, raggae, jazz, rock, pop, experimental, classical, techno, bluegrass, punk, metal, ska, rap, soul, world music and genres of music that are so cutting edge that they haven’t even been defined yet. Meanwhile those other stations just keep on playing that boring crap that makes you want to vomit, man. CILU is the only station in Thunder bay that regulary plays and supports local and independent artists in all genres on all of our programs. No other station in town offers you this type of programming, man and I will personally guarantee you that we will never play any Nicklecrap on this program. Alright, man, that’s right, you’re listening to the coolest radio station in town, cilu radio 102.7fm. cilu is the only station in town that plays fringe programming like this show, man, so make sure and support the station however you can. The station needs all the help it can to stay on the air so go to the luradio.ca on click on the f.a.q. to find out how you can help keep the station alive.